(Los Angeles, CA) Los Angeles World Airports (LAWA) Board of Airport Commissioners (BOAC) has approved a not-to-exceed $2,028,302,301 28-year contract for L.A. Gateway Partners (LAGP) to design, build, finance, operate, and maintain (DBFOM) the Consolidated Rent-A-Car (ConRAC) Facility at Los Angeles International Airport (LAX). The ConRAC will consolidate more than 20 various rental car locations in and around the airport into one convenient facility located adjacent to the 405 freeway. It will feature 6,600 ready/return parking stalls, 10,000 idle vehicle storage, 1,100 rental car employee parking spaces, and more than 2,500 parking spaces for badged LAWA employees. The approximately 5.3 million square foot facility will be built in an area bordered by Aviation Blvd. on the west, Arbor Vitae St. to the north, La Cienega Blvd. on the east and the new 98th St. extension to the south. Last month, BOAC approved an Early Works Agreement with LAGP not-to-exceed $5 million, which allowed the developer to move forward with pre-construction activities such as soil testing, engineering, and design of the ConRAC, all of which are crucial to maintaining the project schedule. 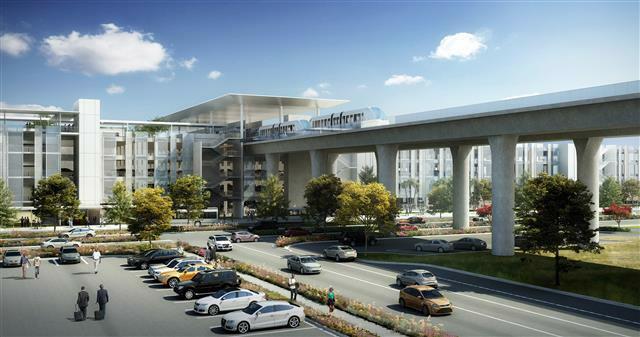 The ConRAC facility will be connected to the Automated People Mover (APM), which will eliminate the need for rental car shuttles to access the Central Terminal Area. With the removal of rental car shuttles, LAX will see a reduction in shuttle traffic and passengers waiting to board curbside at the airport. LAGP had the lowest ultimate cost and second-highest technical score of the four teams that participated in the bid process. As part of their proposal, LAGP committed to delivering an environmentally friendly project. The facility will feature drought tolerant landscape using California native plans and the building will meet or exceed minimum requirements for LEED Silver certification. Workforce development and inclusivity is also a key component of the project and LAGP has committed to partner with LAWA in developing opportunities for local small businesses, creation of good-paying career jobs and fostering economic growth. Collectively, the LAGP team has extensive experience designing, building and operating nearly 30 ConRACs domestically and internationally, including the Atlanta-Hartsfield RAC facility, the Boston Logan Consolidated Rental Car Center, and the Nashville International Airport RAC facility. The other components of the LAMP include the 2.25 mile elevated APM system, Intermodal Transportation Facility - West and associated roadway improvements. LAGP is led by Equity Members Fengate Capital Management Ltd., PCL Investments USA, LLC and MVI Finance LLC. The Lead Contractor is PCL Construction Services, Inc. The Lead Designer is PGAL, Inc. and AC Martin Partners, Inc. The Lead O&M Provider is Johnson Controls Inc., while the QTA (Quick Turn Around) Manager is MVI Field Services, LLC. Key Engineers are Kimley-Horn and Associates, Inc., Englekirk Institutional Inc., and Robert and Company.